Good Morning everyone. I haven't done "Crafty Kitchen" in a while so I thought it was due time to post something crafty!! 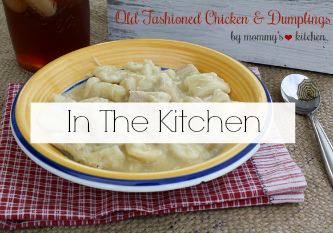 Today I am posting a project that is so cute and fun all at the same time. It is for a "Crayon Goodie Jar". I love to make homemade gifts and so do my children. So with Christmas just around the corner this is the perfect teacher gift. We made these a couple years back for each of my kiddos teachers and they absolutely loved them . You can fill them with all sorts of things. We added m&m's to our goodie jars, but the possibilities are endless. You can fill them with festive chocolate kisses, m&m's, skittles, wrapped hard candy, gummy bears or really what ever you like. If you want you can add a homemade granola or trail mix just add it to a plastic goodie bag and tie a ribbon around and add to the inside of the jar. 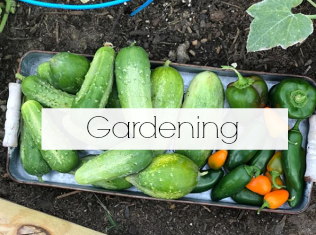 The directions on how to make this cute little project will be at the end of this post. Today I want to kick off December with my first giveaway!!!! I was sent this awesome box from Crayola.com . The box consisted of a crayola crayon tower and a code to print off personalized photo coloring pages. This program is really cool and easy to use. Here is a little information on the product. 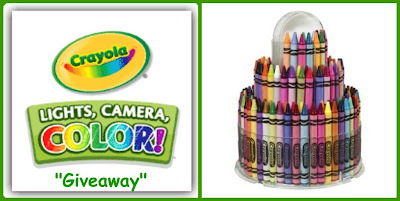 Crayola Lights, Camera Color is a kid-friendly, easy-to-use online application at Crayola.com . 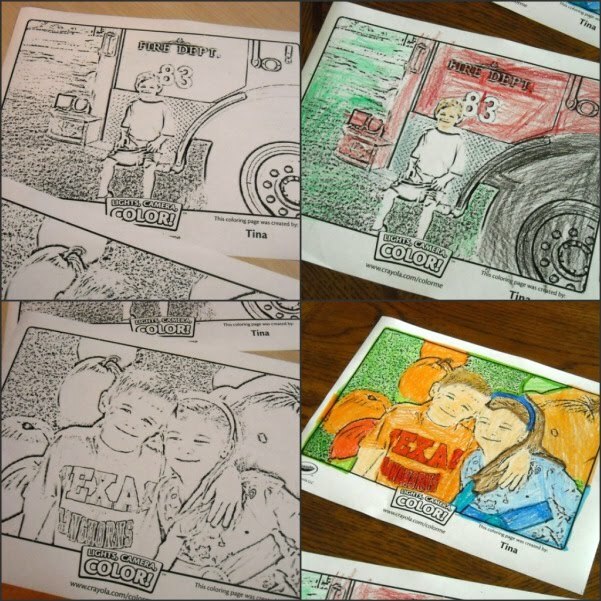 It allows children to upload their very own digital photos and transform them into unique coloring pages, then add fun designs and pictures that turn them into totally customized creations. Specially-marked Crayola crayon boxes (48, 64, 96, 120-ct. as well as the 150-ct. Crayon Tower) will include a code that lets you print off the custom coloring pages. Upload a new or existing digital photo onto the “Lights, Camera, Color” application at Crayola.com/color me. Print out your coloring page or save and send it to Coloring Page Maker to customize with fun graphics. Choose a background: you can choose from several including a desert, a beach, a haunted house and more. Add props such as a hat, mustache, wings, etc. Select words/phrases: “Best Friends,” “Kids Only,” “All Star” to name just a few. Start coloring your one-of-a-kind creation. I have included some photos of my kids enjoying the "Lights, Camera Color"
The kids loved that it was a tower of crayons with so many to choose from. Carson chose a picture of him sitting on a firetruck. The finished product!!!! Really cute and they had a blast transforming their photos in to fun coloring pages. My kids said they loved the Lights, Camera, Color. It would be a nice Christmas gift. Now onto the Giveaway. Crayola and My Blog spark were nice enough to offer one of my lucky readers a Crayola Lights, Camera, Color Gift Package of their very own. You will receive a Crayola Telescoping Tower and code good for six-months of unlimited prints. Details below on how you can enter. 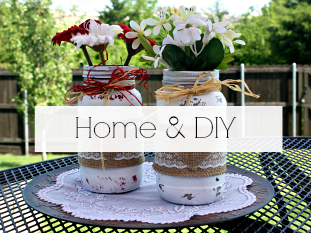 Start by spray painting the lid and rim of the jar with black spray paint. While that dries start gluing the crayons to the outside of the canning jar. Use your hot glue gun to do this. Try to glue on the crayons in a straight line or at least as straight as you can get them. I can't remember if I added the hot glue directly on the jar and then place the crayon on the jar or if I added the glue to the crayon and then stuck it on the jar. Try whichever way works the easiest. After all the crayons are attached put the jar aside. Making sure the lid and ring are completely dry glue your little decoration on top of the lid. Fill your jar with the candy of your choice and add the lid to close the jar. Add a pretty ribbon around the crayons and that's it a pretty cheap but pretty teacher gift. Disclosure: Thank you to crayola and my blog spark for sponsoring this giveaway. I was supplied with a Free Telescoping Crayon Tower for the sole purpose of reviewing this product. I love the coloring page idea! Oh and I'm a fan now on facebook. I am so confused and normally I am good at leaving a comment! HA HA Who knows where the other one went, but it went like this: I love this idea! I think my son will have a ball with this and hey, if I don't win...I will go and buy it! Adorable jar! I love the thought of kids getting to color pictures of things they know!! Just became a fan on facebook. What a fun idea! I like that they can print pictures of themselves and color them. I am also now a fan on facebook! Really cute jar. I'll need to remember this for my son's preschool teacher. We would love to win the Crayola package, too! That Crayon Goodie Jar is soo cool! What a fun idea! This Crayola gift looks great! The Crayola giveaway is awesome.. I love how you can create your own pages to color. The Crayon jar is so neat. This is an awesome craft! 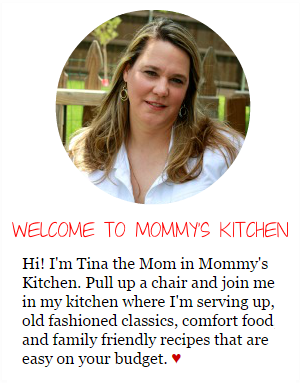 Tina, what a wonderful project. As old as I am, I still love my crayola crayons and my coloring books. It's a great de-stressor. You're such a good mom! I LOVE crayolas!!! My husband makes fun of me, because every time they are on sale I go out and buy them. We have a lot of them, but I figure you can never have too many. I love the idea for the coloring page. Wow that is an awesome give away. I have 3 girls (ages 4,3,1) and they love to color. This would also be something that the Sunday school kids at the church I attend would love to use. I love the jar idea. I will be home schooling my daughters and so arts and crafts ideas are great. I just became a fan on facebook as well, thanks for the giveaway! I love crayons especially Crayola. I just went to FB and signed up as a fan. Love the crayon goodie jar, hmmm, would really make a good present for a teacher. Oh wow! Count me in, please. I just signed on as a Follower too. This looks like a lot of fun for both kids & adults! YAY im a fan of crayola!!! I love the tower of crayons and the crayon goodie jar is a great idea. what a great idea for a xmas gift for teahers!! This would be a cute teacher gift. 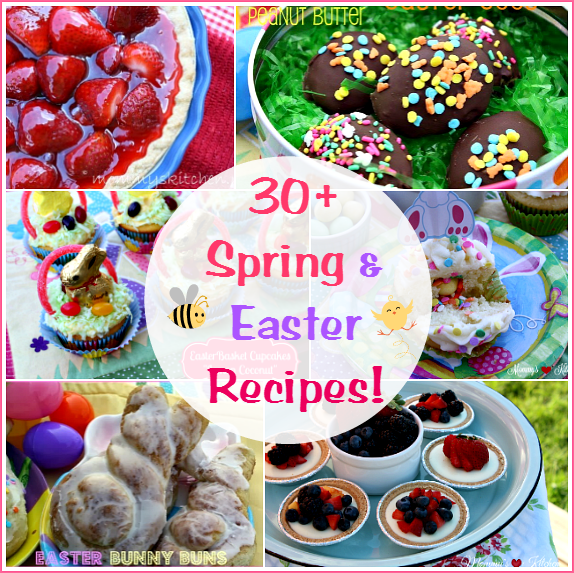 Would love to win this giveaway for my kids.....love your blog!!!!! The coloring page is such a great idea! 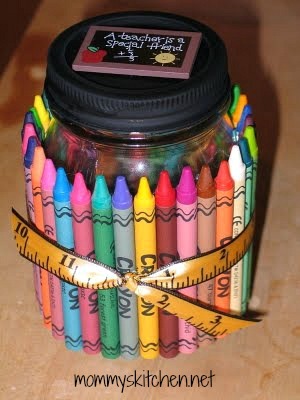 I love the crayon jar idea!! I babysit three kids quite regularly and this would be something FUN to do so they could give to their teachers or even keep for themselves! The "Lights, Camera, Color" thing is AWESOME! Oh, I want one to keep those kiddos entertained!! Looks like fun...I want to win for myself! Coloring is always FUN even for ME! It relaxes me and puts me in a good mood...But my Little boy would love this too! Great Giveaway!! What a fun giveaway! My kids would LOVE the crayons! I thought I'd been following your blog for months and months, but it turns out I was just "following" it via google reader. Now I am an official follower! Just became a Facebook fan of Crayola. Not sure why I wasn't before, Crayola are the only crayons for my family. How cool is that?!? What a great idea and giveaway! I hope we win, thanks for the giveaway! Hey Tina this is so cute. Cole is finally at the age where he loves to color and draw. He would really like this. Sign me up for your giveaway!!! Perfect idea for our homemade chocolate covered pretzels! My kids would really enjoy this. I'm a new blog follower. What a great idea. The grands will love it ~ if I win. I love the goodie jar idea. I think I will make them for my 3rd graders teachers for Christmas. My boys would love this! Sign me up...I would love to win it! love this new product. My son got a digital camera for his birthday, so this would be a neat thing to do with the pictures he takes. okay, I'm a fan on facebook too! What a neat idea and fun giveaway!! sign me up! I think we may just make that cute jar for my son's teacher this Christmas. Thanks for the great idea! This is a great idea. I have been racking my brain for a gift idea for my son's teacher. This is something he can help me with - very special. He also loves the personal color pages. We tried it out earlier. I think we're going to do this for all of the grandparents for Christmas gifts. Thanks so much! This is such a great idea. I have never heard of this Crayola picturebook thing until I read your post. Such endless possibilities!!! !Thanks again!! I love the crayon jar idea, I'm gonna take the kids to craft store this weekend and get the supplies so we can give them as gifts to their teachers! Thanks for the wonderful craft idea! Heading to Facebook next. So excited, I just became a fan of Crayola on Facebook! My daughter would LOVE coloring pictures of herself. That is such a neat idea! 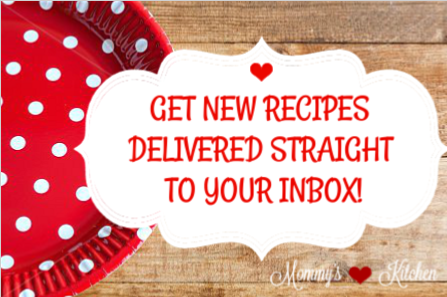 Love, love, love this idea!!!! What will they think of next! I have three girls and my youngest is 6. She loves to color and sometimes when she has all her books and crayola colors out I can also find my two teenagers in there with her!!! Thanks for the opportunity to win such an awesome gift! And I'm a fan on facebook now also! What an amazing blog. I am a huge fan of baking and cooking. I am excited to explore your site. For more wonderful ideas. I am excited about the crayola give aways. Thank for all your fun ideas. My 7 year old is our craft lover. He would love it. Crayola is awesome!!! They come up witht he greatest stuff. We're going to make the jars for our teachers too. Thanks!!! I signed up on facebook and your fan site. 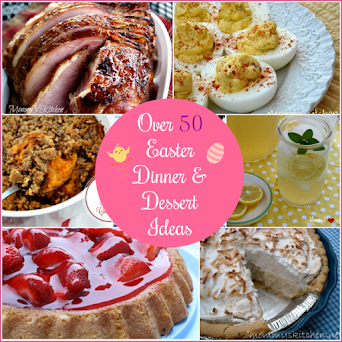 Thanks again for all the great ideas and recipes!! That is soooooo cute! I love your website. I am a subscriber!!! Awesome! My 5 daughters (aka..artists) would LOVE this! oooooo- why didnt we have such a great tower when we were kids?????????????? I'm now a fan of Crayola on Facebook! Would love to win the Crayon Tower! My two granddaughters would love this. If I don't win, will certainly buy it for them. Nice Content. Great idea to promote your product or services is to use customized gifts such as Custom T-Shirts, customized sanitizers and many more. My granddaughters and I are making this on Sat.. they are so excited.. I will have to give this a way with my daughter one day as she loves making things. I’m sure to bookmark your site for future. I am a fan on Crayola's Facebook Page! I LOVE coloring! Merry Christmas Tina, thanks for sponsoring this cool giveaway...stay blessed! I'm not a NEW follower, but I'm a faithful follower! This is a great idea Tina! You are so crafty, I love it! Keep up the good work and Happy Holidays! I love your craft ideas. the Crayola idea is great. What a cute idea. I would love to win for my granddaughter.